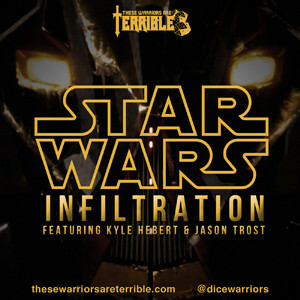 In our final episode of Star Wars: Infiltration, our Terrible Warriors Julian, Bryce, Kyle Hebert and Jason Trost have infiltrated an Olympic Star Destroyer looking for a piece of the Death Star plans. However, an Assassin Droid has stolen those plans. The crew of the Red Scorpion have to destroy the Droid in order to get the plans back. Will they be successful? Listen to find out! LAST TIME ON TERRIBLE WARRIORS...as Kyle Hebert in his narrator voice from DragonballZ would say. Our Terrible Warriors, Julian, Bryce and Special Guests Kyle Hebert and Jason Trost are infiltrating an Imperial Star Destroyer named the Olympic. They have broken out of their jail cell in some very, uh, unique ways. They are now searching the ship for the Secret Empire Plans of Destruction. Will our Terrible Warriors save the Galaxy? Listen to find out! We once again return to a long time ago in a Galaxy far far away with Star Wars West End Games 2nd Edition. This time we hopped on a plane and headed to Los Angeles to play with Celebrity Guests, Voice Actor Kyle Hebert and Actor/Writer/Director Jason Trost. Along with Terrible Warriors Julian Spillane and Bryce Hunter they infiltrate an Imperial Star Destroyer in search for The Empire's Secret Plans.